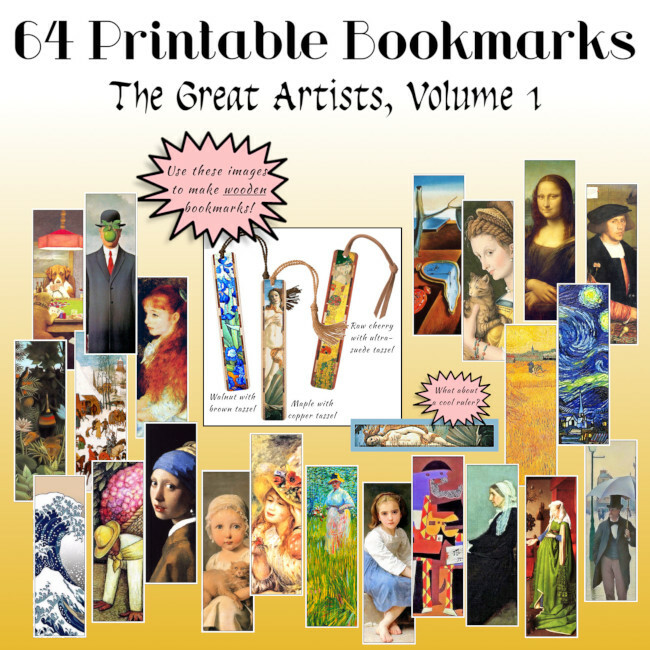 Yesterday we introduced some wonderful new printable bookmarks. The design is of some of the greatest artists and painting in the history of our species. You are certain to recognize many of these masterpieces. There are 64 printable bookmarks and they were so much fun to make that we’ve designated them ‘Volume 1’ since we want to make more. When printed, they are approximately 7 1/2″ x 2 1/2 inches. Check out our article Choosing Printer Paper For Your New Printables if you’re uncertain about what paper to use for the best results. And even more: if you look at the cover above you will see some cool physical products you can make yourself. We’re showing wooden bookmarks with three kinds of wood, plus an amazing ruler of Botticelli’s “Birth of Venus”, the Roman goddess of beauty and wealth, also known as Aphrodite to the ancient Greeks. Many book lovers, or folks who like to give bookmarks as gifts, will see these paintings and be tantalized by them. “I know that. I think …” Of course, everyone can recognize the Mona Lisa but others may be more elusive. So we’ve put and pictures and titles of all 64 below. The artists are Botticelli, Pieter Brughel, Van Gogh, Cezanne, da Vinci, Diego Rivera, CM Coolidge, Renoir, Picasso, Charles Loeser, Dali, Edward Munch, Georges Seurat, Gustave Caillebotte, Gustave Klimt, Hans Holbein, Henri Rousseau, James McNeill Whistler, Jan Van Eyck, Jean-Baptiste Perronneau, Johannes Vermeer, Katsushika Hokusai, Louis-Léopold Boilly, Rene Magritte, Rachel Ruysch and William-Adolphe Bouguereau. You can find these colorful and inspiring printable bookmarks in our BlissPlan shop. Enjoy!